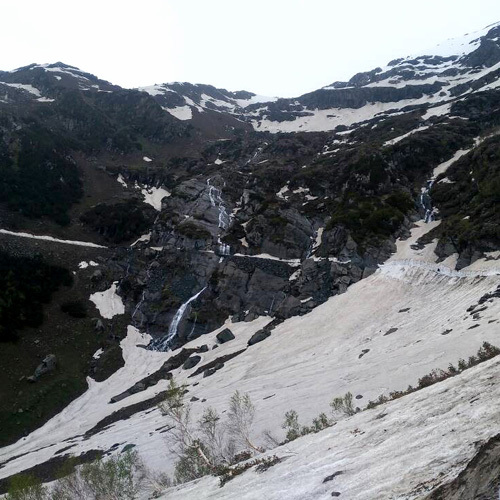 Dalhousie is one of the most popular tourist spots in the North India especially, among home and foreign tourists. Nestled on the spur at the western end of Dhauladhar, Dalhousie in its present shape was founded in 1850’s when the British acquired five hills from the ruler of the Chamba State for developing the area as a sanatorium. The project originated with Lt. Col. Napier, then Chief Engineer of Punjab; (‘afterwards Lord Napier of Magdala”). Unlike several other hill stations of Himachal Pradesh, Dalhousie is favorite among those who seek solitude and restfulness. Even during the pre-partition days, Dalhousie attracted large number of tourists. Some of the distinguished personalities like Ravinder Nath Tagore, Subhash Chander Bose and Pt. Jawahar Lal Nehru visited Dalhousie in their formative period to immerse themselves in the leisurely quiet of this hill station. The calm and composed walks of the thick forests stirred the poet in Ravinder Nath Tagore. Some of his early poems are set against the backdrop of Dalhousie. Sardar Ajeet Singh, chacha (Uncle) of Sardar Bhagat Singh and a freedom fighter himself came to rest his tired limbs in Dalhousie and he breathed his last just before declaration of India’s Independence on 15th August, 1947. There is a samadhi in the memory of Sardar Ajit Singh at Panchpula which is a place frequented by every tourist. Pt. Nehru visited Dalhousie in 1925 and Subhash Chander Bose convalesced in Kynance near the Post-Office for about seven months in 1937. Dalhousie Centenary Celebrations were held in August, 1954. Subhash Baoli: Not far from the G.P.O. Square is the spring at Subhash Baoli with panoramic views of the snow-capped mountains. Satdhara: Sparkling springs close to town, rich in mica and other minerals, are noted for their medicinal properties. PANJPULLA: Beyond Sathara is another pretty spot where the water from a natural tank flows under five little bridges. Bakrota Hills: The Bakrota Mall, a popular walking circuit around these hills has a spectacular view of the mountains. Dhainkund: The high peak of Dhainkund offers a bird’s-eye view of the verdant valleys of the Beas, Chenab and Ravi rivers. KHAJJIAR: A small picturesque saucer-shaped plateau surrounded by dense pine and deodar forests, is one of the 160 places throughout the world to have been designated “Mini Switzerland”. Khajjiar, a tiny tourist resort in Chamba about 24 kms from Dalhousie; at an altitude of 6,500 ft. above sea level. The moment one enters the picturesque Khajjiar, one is welcomed by a yellow Swiss sign for ‘hiking path’ which reads “Mini Switzerland”. Set against the backdrop of dense pines, deodars and lush green meadow, Khajjiar is exquisitely nestled down in the foothills of the imposing Dhauladhar ranges of the Western Himalayas. The dish-shaped Khajjiar provides a panoramic and breathtaking perspective to visitors. Khajjiar was officially baptized by the Swiss Ambassador on July 7, 1992 and as per records, a stone was taken from here and forms part of the stone sculpture erected in Berne, capital of Switzerland. The place is famous for the popular Khajji Naga shrine dedicated to the serpent god from which the name is believed to have been derived. Moreover, Khajjiar has an islet with a small lake surrounding it. The lake is considered to be holy by the locals as legend associated it with Khajinag, the deity in the Khaaji temple. Kalatope: Located almost midway between Dalhousie and Khajjiar, Kalatope is a beautiful forested area. A very thick and dark forest crowns the hilltop and perhaps that is why the place has derived its name as Kalatop which literally means a black cap. The spot really commands a panoramic view of the surrounding landscape. One can see the hills, snow-capped mountains, the valleys, the hamlets, the greenery and the ruggedness standing from the place. The forest mainly comprises of the deodar, kail, spruce, ban trees and various bushes providing a safe habitat for wild animals. The place has already been declared a wild life sanctuary by the government. Pheasants and Monal and various other birds can be frequently seen in the place. Leopards, black bear are also found by a travelers occasionally.